How to buy a novelty ID Card? Simple! 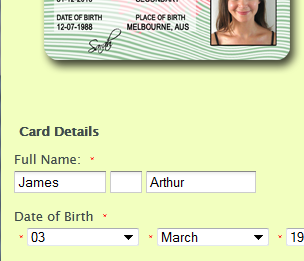 We offer high-quality Australian Novelty ID Cards with your details and picture printed on high-grade PVC Plastic (the same material as Credit Cards) in an easy 3 step process. How to buy a fake ID or Novelty ID? Head over to the fake id maker order form found at Order Page to select which card you’d like to purchase. Fill in the details you’d like printed on the card. Make sure you use your correct email as payment instructions will be sent to it. Note: In the first section of the order form you will fill in details that get printed on your card. This can be any info you want. However in the second section of the order form you must use a real address as this is where we will send your novelty id to. After you have successfully filled in the form and uploaded the picture you want on your card you will be shown payment instructions. You will also receive an email from us confirming your order. The rest is up to us – how long your card will take will depend on which shipping method you have purchased. If you have purchased regular shipping – there will be a 5 day queue to print your card and another 4-5 days for it to reach you. This is the most basic postage method. It WILL not reach you this weekend. If you have selected ‘express post’ but not selected ‘skip the queue’ then it will take 5-6 days in total. This is because your card will still be at the back of the queue for printing. If you require your card urgently then we STRONGLY RECOMMEND that you select express post + ‘skip the queue’ – then it will take you just 2-3 days to receive the novelty ID card once we receive payment.